Pool trowels, pointing trowels, margin trowels, finishing trowel, finishing tools. Different types of spreading tools are available on the Spreaders and Palette knives, spatulas pages. 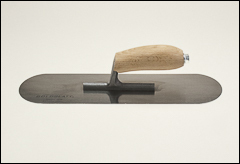 Stainless steel trowel with a shorter shank to allow more flexibility. Round edges prevent surface gouging. A smooth, no-turn camel back wood handle. Flexible carbon steel with a 2 3/4" heel. Steel ferruled, no-turn maple handle. Flexible carbon steel. Durable steel ferruled, no-turn maple handle. Durable stainless steel. Smooth, no-turn camel back wood handle.